This may not look like a success, but for us it is! See that "w" he's forming! I'm taking a break from sharing my Tot School post this week to share some of the activities we've done that have (finally) engaged my reluctant preschool writer. (I use writing with my preschooler to include drawing, coloring, scribbling, tracing and the actual formation of letters and numbers). 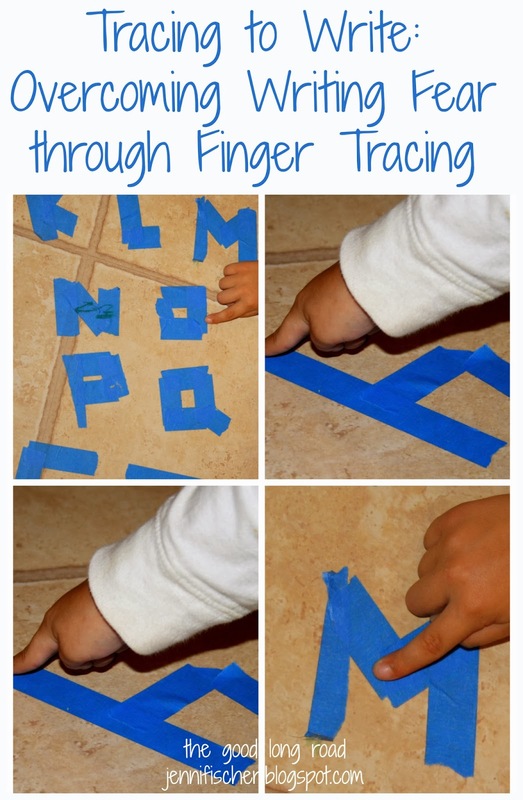 Fine motor skills receive a lot of attention and emphasis as essential skills for toddlers and preschoolers, and I often see parents and educators stressing this even more with boys as many believe that boys may be delayed in their writing skills in comparison to girls. I am NO expert and do not intend to enter into a debate or discussion of boys in comparison to girls with fine motor development and writing. 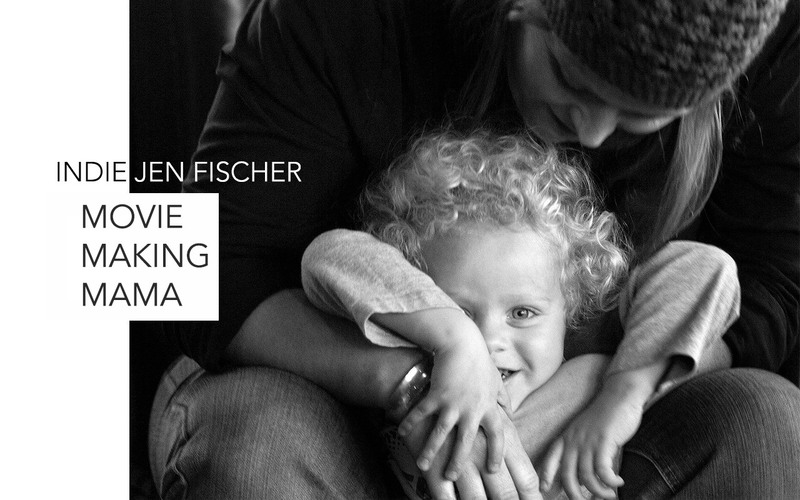 Rather, I intend to share my own experiences and observations as a mother of two boys. In general, Wild Thing typically displayed little or rare interest in "coloring." He enjoyed other fine motor activities and sensory bins with items to "transfer," but "coloring" and holding crayons was frustrating and not fun. (Caterpillar, on the contrary, also a boy, began coloring when he was between 12-18 months). Still, even now Caterpillar (now 2) will ask to color much more frequently than Wild Thing (almost 4) does. However, Wild Thing always loved books and letters and could recognize all of his letters at an early age (around 2). At 3, he finally began to be interested a bit more in coloring and "writing." However, he was still easily frustrated. He wanted everything to be "right," which of course was not the case given his motor control. We have finally began to make progress with his interest and enjoyment in trying to write. I've looked back and noted which activities seemed to help us with this shift. The first success came when I purchased some large letters for tracing from the dollar store. They are the ones intended for classroom bulletin board borders, I believe. I would tape them to poster board and then put the poster board on the floor and give Wild Thing crayons. I think being on the floor helped as did the size of the letters and the arrows indicating how to guide his hand -- instead of the freedom of drawing and/or coloring everywhere. Recently, a fun alphabet learning activity I initially set up for Tot School for Caterpillar evolved into a great pre-writing activity as well - in fact I think it is our most successful writing activity to date. Initially, I used painter's tape to put 5-7 different letters on the floor for Caterpillar to find the letter "F" during F week. 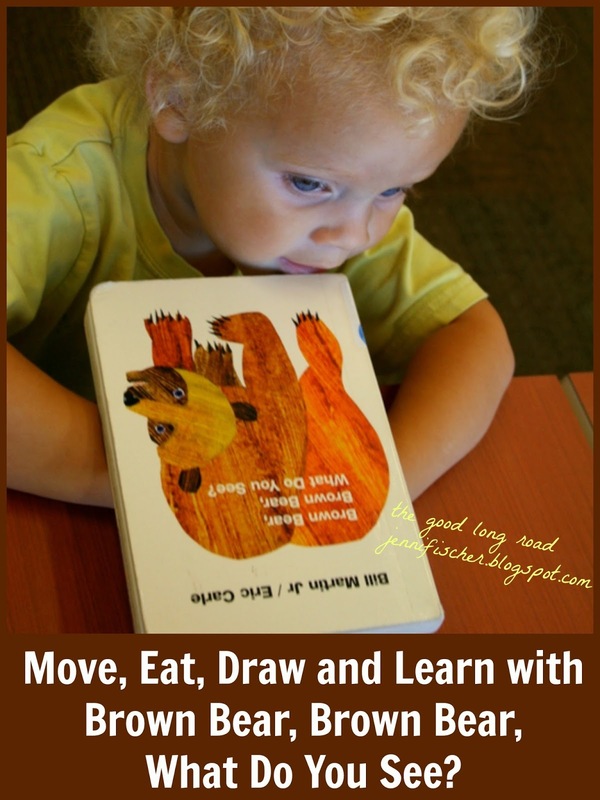 I also spelled out the word "Frog" as something Wild Thing could find and we had lots of fun playing a little "Leap Frog" game, which I still need to share on the blog!! As the boys and I wrapped up dinner, Daddy disappeared. After dinner, we went into the living room to discover that he had re-used all of our existing tape, and we now had the entire alphabet on the floor (as our frog game had evolved, we began moving tape to create new letters and words and had started on the alphabet project). The boys loved the surprise! Then, Wild Thing began tracing the letters with his fingers. Soon, the tracing evolved, and he was tracing the letters with a marker. Finally, he pulled out a notebook and began drawing and writing in it as well. Encourage gently, but don't push. Make it fun! (Jumping on letters and getting to "draw" on the floor is fun). Tracing letters with fingers is a very important part of the writing and reading learning process that really empowered my son. Every child has their own pace and that's okay. When one thing doesn't work, try small adjustments --- taking paper from a desk to the floor made a big difference for us. (I make sure we use washable markers when doing floor drawing/coloring as they wash off easily or a put a very large piece of poster board or even two pieces taped together underneath so that any extra coloring goes on the poster and not the floor). Textures help. I think tracing the tape also helped because the tape has a texture that he can feel, rather than just tracing letters written on a page. We've also traced foam letters with our hands with similar interest and success. Put it on hold. (Throughout the past 6-8 months, we've had weeks when the crayons and/or markers rarely came out, and I didn't force it. Then, we'll have weeks where we color everyday). Encourage and celebrate the activity and ask them to tell you what they've drawn or written. (I noticed that a lot of Wild Thing's initial timidity and lack of interest came from him being self-conscious about what he was creating and from not feeling like he could "do it right." Praising what he creates and having him tell me about it keeps me from naming the wrong letter or animal and raises his confidence, which helps him keep trying and then he gets better). Read. Read. Read. Wild Thing's love of books and love of letters connected with his interest (finally) in creating letters himself. Plus, through reading I knew that he was internalizing letters and words even when he was not interested in trying to create them himself. 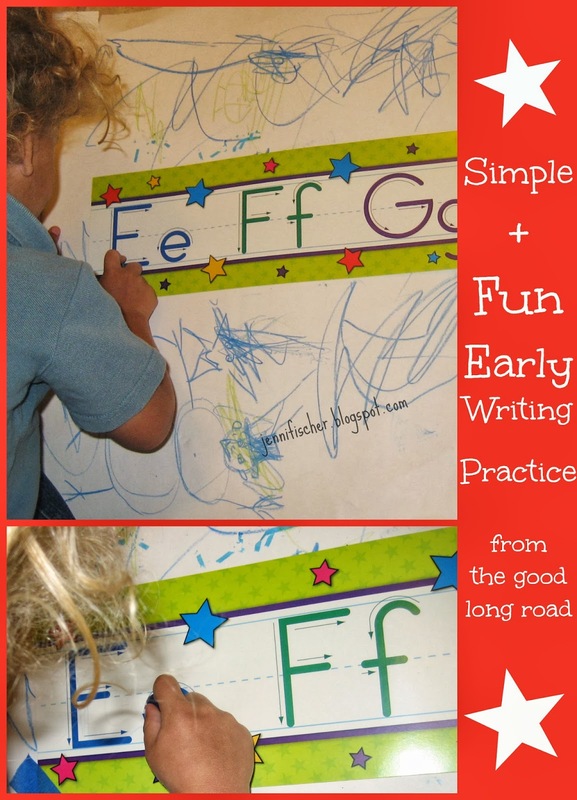 Some other tools we've used that have excited Wild Thing about writing include: stencils as well as a white board with dry erase markers. (I have alphabet stencils and stencils of items. He loves using both). 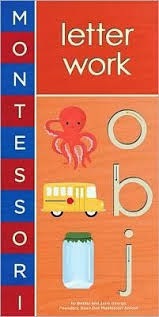 I also love the Montessori Letter Work Book. Friends have it. It features lowercase letters with arrows to follow for tracing the letters with finger and each of the letters is textured. It's on the Christmas Wish List! (There's also a numbers one as well). If you have a strategy that has worked well in your home or classroom for exciting children about early writing or have a favorite pre-writing activity, please share it! I'd love to see it and to pin it to my Early Literacy Pinboard. What wonderful ways to work on letter writing! I think I have to remember that last tip the most - my 4-year-old loves to read but she just isn't in to the writing part. She's starting to be interested but at least by reading often she's getting the idea of what letters are. Thank you for these helpful tips! Such a great idea! I've had my eye on Bobby's book for a while now! What a wonderful way to get a reluctant writer started. Sometimes all it takes is engaging them in a way that appeals to them! Good for you for discovering what that was, Jacquie! Pinning to my literacy board!